CHRISTIAN Ntouba has said he is ready to return to the country for a reunion with Dynamos if the Harare football giants are willing to meet his demands. The two parties' relationship ended acrimoniously in April this year when the Cameroonian, who still has a running contract with Dynamos, flew back to his country after he fell out with the club over their failure to pay his salaries and allowances. Some of his demands included getting part of his salary and allowances in foreign currency, which the club could not afford at the time.. But the new club's executive have started a re-engagement process to bring the big centre forward back to Harare, and his manager Gilbert Sengwe yesterday confirmed they have been approached formally, and his client is ready to return. "There have been negotiations, but it's too early to give details because there is nothing concrete on the table at the moment. I have also spoken to him (Ntouba) and he says if everything is sorted, he is ready to return," Sengwe said. Ntouba left the country on April 28, after he had been frustrated by the Keni Mubaiwa-led executive who were failing to settle his signing-on fees and allowances, as well as refusing to pay some of his salaries in foreign currency. He was owed $16 000, that the club's sponsor NetOne later tried to settle, but the big centre forward had already made up his mind to quit. The West African played a big role in Dynamos' campaign last year when his 12 goals helped the side finish second in the title race when many people had written them off. Without his goals, DeMbare has been dismal this season, hovering just above the relegation zone after 18 rounds of matches. Club coach Lloyd Mutasa has made it clear that his team's problems this term are down to a lack of a proper gunman in the mould of Ntouba. Speaking after his team's 1-1 draw with Chicken Inn at Rufaro Stadium on Sunday, Mutasa said he is confident that Ntouba will return to the club. "I wouldn't want to get much into that because those are administrative issues, but Epoupa has Dynamos at heart and it won't be a surprise if he comes back home," Mutasa said. Samaita, as Mutasa is also known, was once again left frustrated after his side missed some good opportunities to score more goals in a match that they played second fiddle for most parts, but created the better chances. 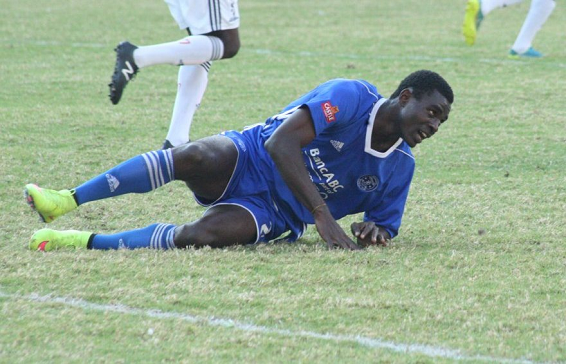 Striker Quality Kangadze gave Dynamos the lead three minutes after the restart, a goal which was cancelled on 90th minute by the club's former player King Nasama. "Valentine Kadonzvo had a chance, with the keeper to beat, but he fluffed it over. Cleopas (Kapupurika) also had a chance in the second half, so we had two clear cut chances and if we had put them away, we could have come out victorious. I wasn't happy with the conversion rate, we created a few chances, but we only managed to score one. If they had scored another one, it could have been better," Mutasa bemoaned. He revealed that the club has two slots open for new acquisitions, and reports suggest that they would be filled by Ntouba and former Denmark-based midfielder Tanaka Chinyahara, who has been training with the squad recently.